The leveling of the maxilla, the managing of the maxilla relative to a proper oriented head and cervical neck, and the concern of a proper occlusal plane are steps toward idealizing the finishing of the restorative case in a phase II treatment. Leveling of the maxillary plane relates to both function and esthetics. Red dots = HIP reference line. Depending on how the clinician and technician chooses to mount the maxillary cast (classic HIP with fence post and Incisive pin (level) or Modified Fox Plane (angled)) will affect how much tooth reduction is necessary to accommodate the same curve of Spee. Managing the GAP on an optimized trajectory regardless of cants and roller coaster occlusal planes either on the upper or lower arches using an orthotic based on a HIP or Fox plane technique is of little significance in phase I treatment. All that is basically required to assist in bringing normalacy to the dysfunctional head and neck system is the agreed upon physiologic GAP that is established on a proper trajectory. A lower orthotic placed between two distorted and skewed arches certainly fills in the missing components of occlusion to help relate the upper and lower arches together and with good anatomical occlusion has shown to help in maintaining the neuromuscular myo-trajectory, improving head levelness (from pathologic upward tilt to a physiologic leveled head tilt). 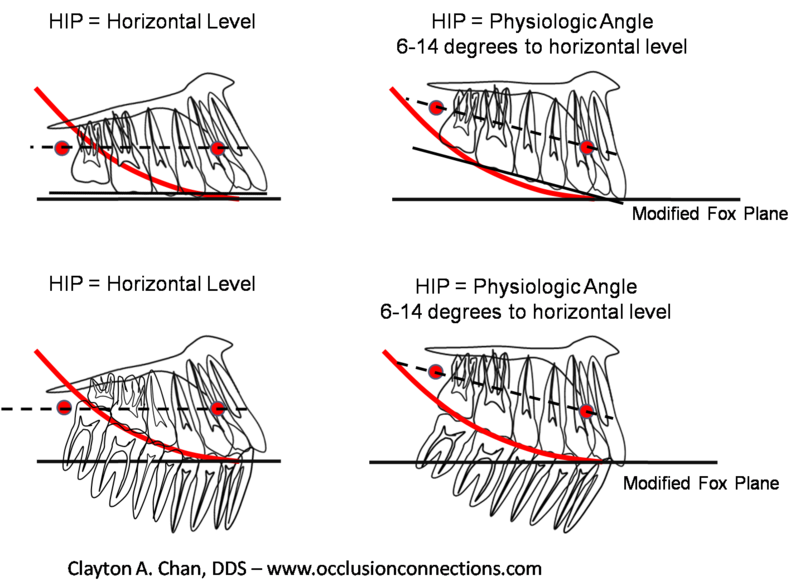 Many clinicians have observed these head re-orienting responses with their patients regardless of Fox Plane or HIP techniques, because the Fox and or HIP does not come into play during the Phase I stabilization phase. It becomes a factor when moving into the Phase II level of esthetic restorative finishing of the case as it relates to crown root ratios and smile lines. If the lab “truthfully and honestly” managed and maintained the classic HIP mounting position from start to finish of the case, the dentist will routinely see shorter upper posterior crowns and longer lower posterior crowns. This is not anatomically correct. This will often cause the labs to cheat the upper crown fabrication, by reorienting the maxillary cast, since the upper posterior preps will not have sufficient occlusal reduction (based on this mount) especially in the second molar regions. Because of this lack of occlusal prep height reduction the lab is forced to remount and alter the cast from the original HIP mount to accommodate the lack of occlusal height reduction. (This is what the labs don’t tell the dentist!) The lower crowns will show, routinely, a longer (higher) crown (crown root ratio) and does not reflect proper golden proportional relationships. We strive for golden proportioned anteriors (tooth width ratios and gingiva to gingiva relationships), yet the posterior uppers and posterior lowers are distorted in crown lengths ratios (a failure of the classic HIP concept!) and not evenly balanced in their upper to lower posterior crown lengths (another failure). With the Fox plane technique the crown to root ratios in the upper and lower posterior regions are more proportional and reflect a better even distribution of crown to root ratios of both upper and lower posteriors (closer to golden proportions) due to a proper maxillary cast orientation due to a proper occlusal plane set up (see picture above). Consider the same curve of Spee used in both situation. Different crown root ratios of upper and lower teeth will result depending on which method is used to mount the maxilla. If you choose HIP, make sure you reduce the prep sufficiently so the lab doesn’t have to alter the maxillary mounting occlusally! Don’t be surprised if the lower posterior crowns look longer, the upper posterior crowns shorter and the upper first molar to second bicuspid region looks a bit more toothier. If the HIP is the method of choice in Phase II restorative, make sure the lab doesn’t alter your mount during the finishing of the case. Over the years they all tend to cheat this step and don’t tell dentist that they altered the mount to accommodate the occlusal plane. The clinician can always confirm the HIP mount by telling the lab that you will be checking the maxillary prepped cast with the finalized porcelain crowns on the prep dies in place at the HIP mount referenced to the table before crowns delivery! Make sure they don’t change or alter the HIP mount if you chose to do so! The dividing of the crown ratios between the upper and lowers (as seen in the diagram above) will vary depending on the maxillary cast orientation technique. Doctors and technicians have choices! We all need to understand these concepts thoroughly to make the proper choices for our patients.